Miguel graduated from the University of Barcelona in 2007. 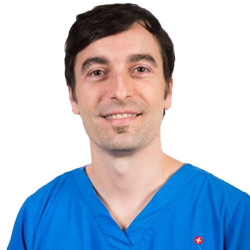 After a year working in a referral emergency centre in Barcelona, he moved to UK in July 2008 where he undertook a surgical internship at Fitzpatrick Referrals gaining extensive experience in all aspects of small animal orthopaedic and neurosurgery. Following his interest in small animal surgery, he moved to Cambridge to take up a one year junior training scholarship at the University of Cambridge. Miguel has completed a three year European College of Veterinary Surgeons approved residency programme in small animal surgery and became a diplomate of the European College of Veterinary Surgeons in February 2015. Miguel’s interests lie in the management of canine cervical spinal disease and in the treatment of humeral intracondylar fissures in the canine.